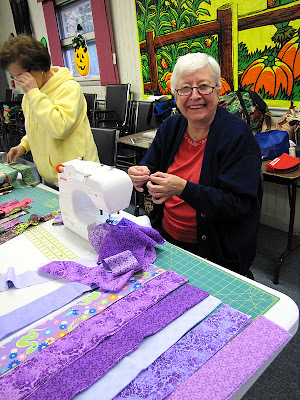 Canton Village Quilt Works: We're Off To The Races!! Fast, fun, and furious sewing. Love all of the different looks. I really like the bright one and yours. I did one and I don't like it. I have cut it into blocks but still haven't made them into a quilt. I know lots of people don't care for these quilts but I think they are wonderful. I think it depends on what fabric you use. Plus, it's a quick and mindless quilt that can use up lots of scraps too. love the variety - I have some strips in black, red, and white that I intend to make one of these with and I will check out the video and instructions, I know I have seen it someplace but haven't marked it. It looks like you all are having too much fun! Our guild is doing this activity next month. Looks like a lot of fun! Looks like you had a great day! Love the quilts & can't wait for the BOM tomorrow! What a fun day! And to come to the end of it with an almost finished quilt. Can't think of anything better. Love your quilt, and all the others. I love the jelly roll race quilts! I just yesterday finished quilting one that's black and white with some reds and blues thrown in...and basted one in happy young girl colors, too! They're so quick, they make great gifts. Our friendship group does a weekend long retreat in a few weeks.This is on our plan too! It looks like everyone had a great time and finished a top to boot! Thank you so much for sharing this! 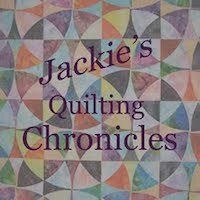 I had never seen this quilt and have 2 jelly rolls that i was waiting on the perfect project for, this is it! Really looking forward to the next BOM tomorrow too! Ha -- looks like you guys had a LOT of fun. I especially like the touch of the spiders LOL! What fun! There's nothing like sewing with a group to get the creative juices flowing. What a great way to spend the day with friends. 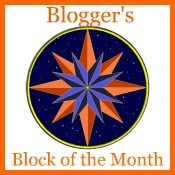 Love the quilts and the surge protector! I really like the black and white one. I have been thinking of making a black and white with a couple of big bright flowers appliqued on it. 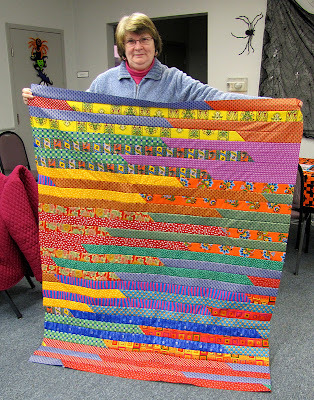 Now that looks fun and some really great quilts came out of those jelly rolls. I love your black & white race. 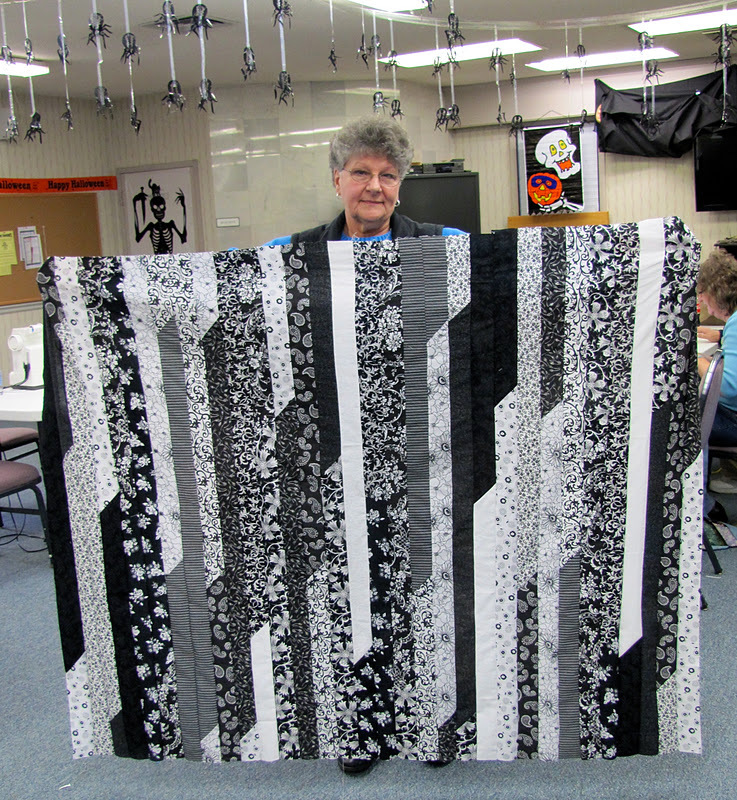 I have a B/w jellyroll that I may just do another one after seeing yours. I wondered how they were made! Thanks for the link...I love Wanda's color choices. Have You Ever Seen A Soul Flower?? How About A Mountain Getaway? Have You Ever Seen A Glacier...?